I have had a bean bag in my place of residence ever since I was a teenager. They are very handy to throw somewhere and sit. When you play guitar or want to watch a movie it’s a comfortable place to sit. They are also affordable and can be a good alternative sometimes to chairs. The only part of owning one I don’t like is the inevitable end when the white small styrofoams like “beans” (expanded polystyrene) start coming out and going everywhere. I would like to get an original leather bean bag one day. According to some historians, bean bags were first invented by the ancient Egyptians sometime around 2000 B.C., and for thousands of years, they were used to play games and for other recreational diversions. The first bean bags were small, round and made of leather. They were most likely filled with dried beans or pebbles. 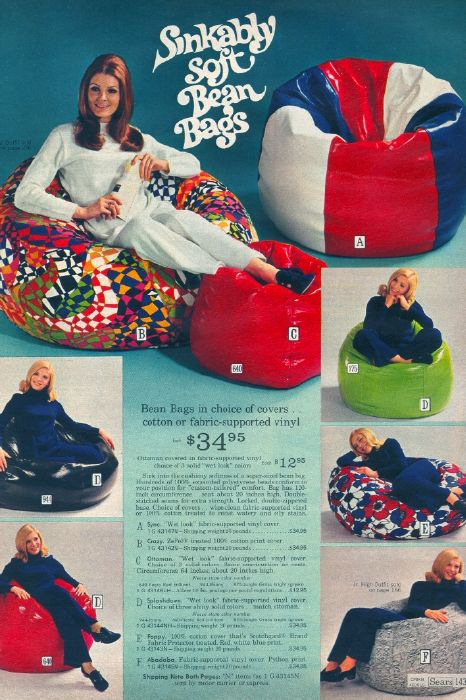 The first bean bag chairs as we know them were developed in the sixties. They were first called a Sacco chair, and released in 1969. They were designed by Cesare Paolini, Piero Gatti, and Franco Teodoro who were commissioned to create the piece by Zanotta Design in Italy. Bean bags were huge in the 1970s and they were at first usually made of leather and filled with PVC (short for PolyVinyl Chloride) pellets. Soon nylon and polyester were used with expanded polystyrene (EPS) for filler. That combination proved to be more durable. During the 1980s and 1990s, the popularity of bean bags declined greatly in popularity, but they were still being manufactured by several companies. Now they are now experiencing a strong resurgence in popularity. You can get a regular bean bag or one pre-formed into a chair or couch. They are being sold for use as pet beds. Same problem here- the ones we had kept coming apart- other than that… they were comfortable. I love them…except their end of life. The are nice.